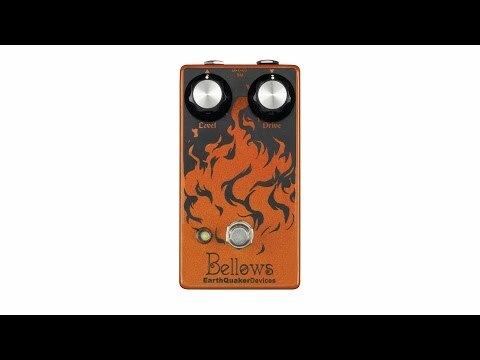 The Bellows is a back-to-basics, transistor-based dirt device. This two-knob wonder has a whole lot of character for such a simple, unassuming pedal. It straddles the line between amp-like grit and fuzzy saturation to create a remarkably vintage, tweed-type tone. Similar to the volume control of a “non master” amp, the Drive determines how hard the signal hits the input. At lower drive levels it's a little wider and grittier. Resist the usual urge to dime it and keep the Drive low for mellow, amp-like break up. Slowly bring up the Drive and you'll eventually end up in blown out fuzz land, having passed a bunch of useful distorted places in between. It's pretty much every era of rock n' roll in a box. While designed for guitar, Bellows also handles bass extremely well at growling low and scorching high levels. And if you're a guitar player that fancies themselves a bass player- then forget it, this is your favorite dirt pedal. Each and every bellows is made by a bunch of bearded dudes and a couple ladies in the comedic drama section of Akron, Ohio.